Now or never – that’s what I thought yesterday when I wrote the notes for this blog post down. Although it might be a bit too dramatic. Yesterday night frustrated me and even made me angry about things going on in KDE. And thus I think and thought it’s finally time to start my blog series. 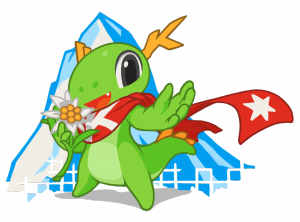 Over the next weeks I’d like to write a blog series with the title My Wishion of KDE. Over the last two years I collected many thoughts and notes and with this blog post I’ll put some more pressure on myself to finally arrange these notes and ideas and finish the blog posts and publish them. And I want to do this as well because most of the time I prefer to improve things and progress them, fix them, do the work rather than just rant and criticize (destructively, constructive criticism is great and important) and it’s Free Software in its core as well: just do it (others might or will follow). There are quite some things failing inside KDE but I heard there was quite some positive energy this year at Akademy and we just finished/ended the longest Randa Meetings yet and although these meetings were for me quite exhausting they were another great success and almost the size of half of Akademy this year. Just compare the group pictures. And I met again some great people, new and old, young and old, with great ideas, a lot of energy and willingness to put in some energy and with the incubator projects I sponsor there was and is even more enthusiasm coming to KDE. So this is the introduction or first part of my series about my Wishion of KDE. With this word creation I’d like to underline the ambiguity of my wishes for KDE on one side and a vision for KDE on the other. Where are we now? 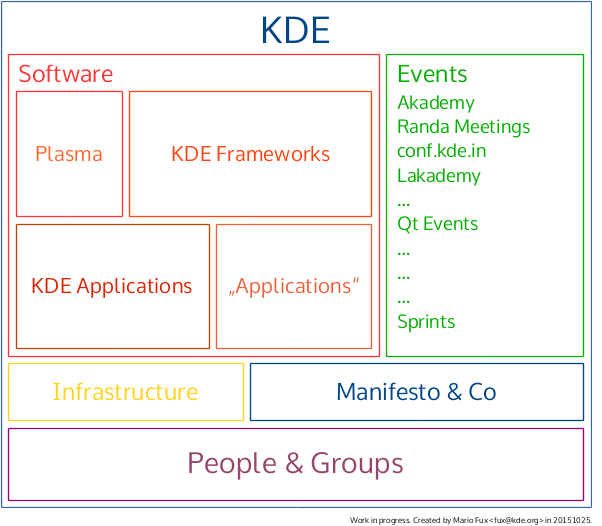 What is KDE currently? 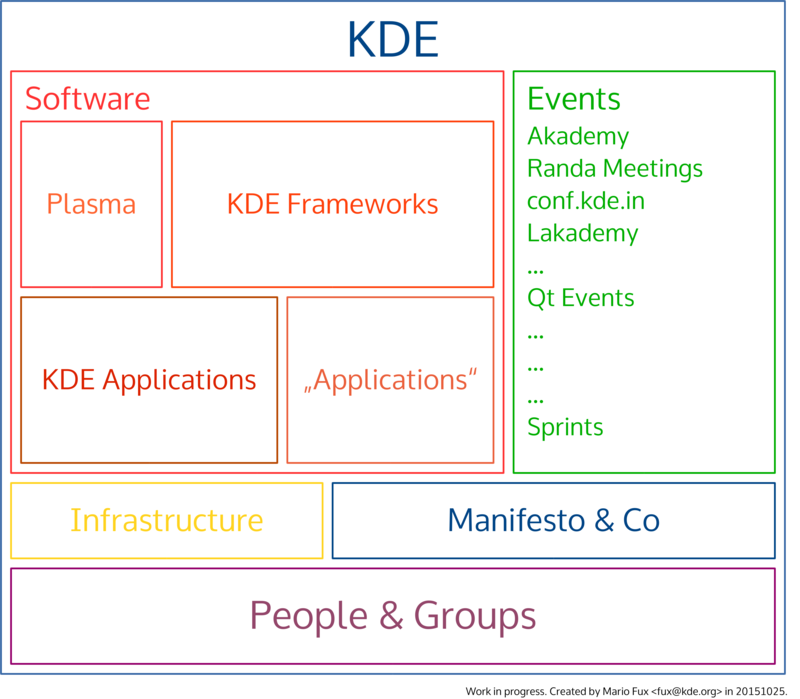 Where and how do I see KDE in the future and the coming years? 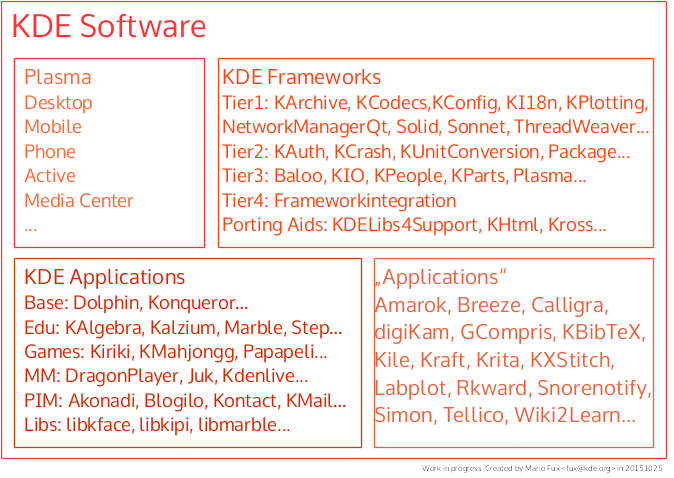 And where do I think KDE should go? What should we do and change to reach this future? How could we do this and what to achieve this wishion? What could I offer and how could you support me in this? As I wrote this is my Wishion and thus just MHO (my humble opinion). 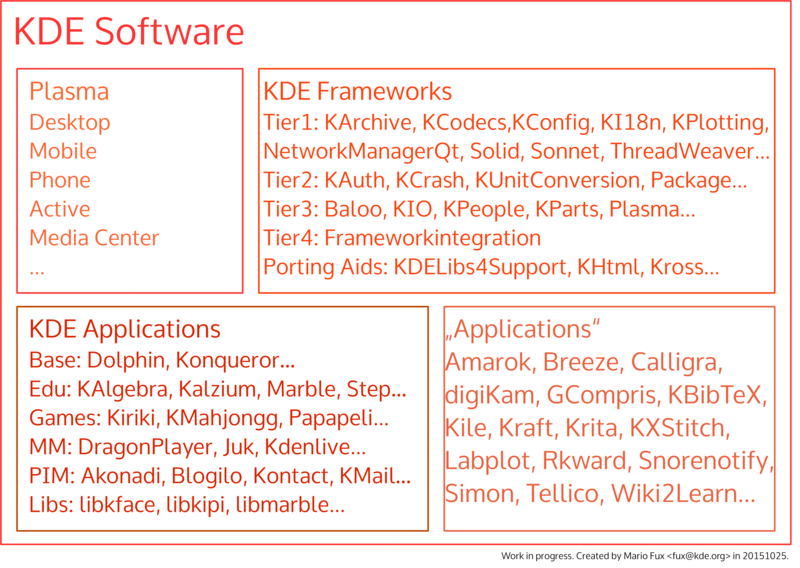 Nonetheless I think that with the work I did in KDE, in several areas and for quite some time I’ve got a good overview and insight and thus think my Wishion might be of some interest for other people too. If you like this, please spread the word, translate this blog sories, ask, comment, tweet and Co (I’m not the “social media” guy although I think that I’m quite social and use IT for almost two decades now in a very social way). Read you soon. At least next week. I’m exhausted and tired, but it was great and a lot was achieved. And as people just start to report about it and publish blog posts it was decided that we prolong the fundraiser for another two weeks. Thus it will officially end on the 30th of September 2015. The reason for this prolongation is the shaky internet connection we had in Randa during last week. Most of the people will report about what they did and achieved in the next days. And if you are interested you can still checkout what was planned for the Meetings in the middle of the Swiss Alps. And there are some notes about the achievements too. So don’t stop to support this great way of bringing you the software and freedom you love. This year I will participate at the Randa Meetings for the second time. The last year was a great experience and I am really grateful that there was this opportunity to get in touch with the KDE community as a new developer of the recently incubated QtQuick port of the GCompris project. As Randa is mostly financed by donations, it is obvious that this opens the door for students and hackers, that don’t have the financial means to join such an event. Working full time I can afford to pay my travel costs myself and personally I see the benefit of code sprint events first of all in the time, they give you for your project. Before talking a bit about what I plan to work on this year at Randa let me say some words on the importance that such code sprinting events have to open source hobbyist like me. As probably many people involved in open source software development I work full time as a software developer and hack on open source software in my free time, because I dreamed the dream of making my hobby and my passion my job. But — ay, there’s the rub! When you come home after 8, 9, 10 hours of concentrated work on source code, maybe project controlled and sometimes under time pressure you can imagine that there is not much passion left for more hours doing the same activity. Of course, there are the weekends, that leave you more time for your own projects, unless you spend them with your friends or your family and your children, that you don’t see a lot during the week. So, this dream sometimes turns into frustration about not having enough time for what you really want to do. The concrete victims of the lack of time for your hobby are a bunch of uncompleted feature branches that have been started driven by a great idea, but slowly forgotten in the highs and lows of everyday life. The first one, balancebox, is about a new activity in GCompris I started last winter, that introduces a 2D physics engine in GCompris. The idea of the activity itself is simple and should probably placed in the “Fun” section of GCompris. The user is supposed to navigate a ball through a labyrinth of walls populated with holes and numbered buttons to a door by tilting his device. The numbered buttons have to be hit in the correct order to unlock the door. This obviously mainly targets mobile devices that provide sensoric information about device rotation (on desktop platforms tilting is simulated by using keypresses) and addresses fine motor skills as well as basic numeric counting capacities of the child. Once integrated, a 2D physics engine opens the door for a variety of other activities that cope with real world physics. As a next step I plan to use Box2D also for porting the Land safe activity from the Gtk+ version, where the player has to land a rocket smoothly on planet surfaces with different gravitational forces. I am looking forward to discuss the possibility to use Step (or more precisely stepcore), KDE’s physics simulator, as an alternative physics engine with other members of the KDE Edu team in Randa. Besides working on GCompris, I’d like to benefit from my week at Randa by coming a bit closer to the KDE Connect code-base, that is still pretty new to me. Since using KDE’s Plasma on the desktop I discovered KDE Connect as a really useful tool in everyday work and use is mainly for file-transfer and notification synchronization. A feature I missed in everyday use so far was the synchronization of notifications in the other direction: from desktop to mobile. Thus you can get notified e.g. of incoming messages of your jabber/IRC client when away from keyboard or whatever event that is not available on the mobile side. First I hacked around that by implementing a small wrapper that proxied all Notify calls on my desktop’s DBus org.freedesktop.Notification interface using a kdeconnect ping-message to my mobile device. This was the beginning of another pair of feature branches, that integrated this feature directly into kdeconnect-kde core and kdeconnect-android, resp. The code is mostly working already, although there are some issues with specific Android-versions. As KDE Connect is one of the major topics this year in Randa, there will be the right place for resolving these missing bits and discuss some more questions regarding configuration of the notifications module directly with the KDE Connect developers there. A big “Thank you!” to all donors and the organizer(s) of this event!